My clients make others' lives happier, healthier & more beautiful. Their products & services enrich our outer & inner lives alike. My clients celebrate the beauty of our physical environments, but also the lovely experience of living: what it means to make a home, to express ourselves, how we connect and collaborate, how we learn, grow, and create meaning and joy in everyday moments. As growth consultant Janice Sousa’s new business began to grow, she realized she’d out-grown her old website. It didn’t reflect her results (which are jaw-dropping) or the unique, hands-on way she works with clients to make their revenue goals a reality. Together, Janice and I teamed up to envision a site that set her apart and conveyed the tremendous value of her work. The finished product is a site that highlights Janice’s expertise and impact while mirroring her own style and delivery of results: bold, direct, efficient, and effective. The numbers speak for themselves. Ashley Layden changed my mind about boudoir photography. I didn't get this trend until I talked with Ashley about the website she wanted to create to evolve her business from wedding photography to boudoir. She shared how her clients are often going through big change – having babies, at new levels in their careers, getting married – and they want a way to celebrate their bodies' ability to carry them through it and their spirits' resilience in the face of new challenges. Oh yeah, and these women want to feel beautiful and badass. Ashley had me at "badass women!" The effect she has on her clients' lives is profound. I loved bringing this mission alive through her new ShowIt site! Designer and business owner Leslie Howard finds, fixes up, and makes fabulous beautiful vintage furniture – always with striking style and often with a sense of humor. After her clunky Wordpress site and blog had sat stagnant for years, she reached out to me to develop a web design that truly reflected her high end product's quality and unique personality. I created a custom Squarespace site that reflected our strategic and artistic goals – and facilitated a simple and seamless transition from Wordpress. Trek + Bloom Photography Co. Photographer Liz Charney was ready for a website that truly reflected her photography style (wild, emotive, and timeless) her personality (laid back but passionate about adventure), and her clients – souls that roam, who are looking for a couples photographer to capture their love on windy beaches, tippy-tops of mountains, and wild places all the world. Keeping her site simple, pretty, and clean were also part of Liz's design values. Together, we honed in on these key feelings and created written messaging and a web design that transports you right to the top of the fjords of Iceland. Psychotherapist and business owner Nikolai Blinow was ready for a total website overhaul. But between seeing clients, growing her business, training her therapy dog (oh, and giving a TEDx Talk! ), updating her website never made on her to do list. Together, we mapped out her goals: a site that enabled potential clients to "meet" Nikolai, learn about her unique approach to therapy, access a library of mindfulness-based resources, and easily take action to book appointments. We also shaped her written messaging so it would resonate with her ideal clients before I brought it all alive in a peaceful, modern custom design on Squarespace. When the award-winning writer and educator Heather H. Thomas asked me to create her first ever website, it was a collaboration dream come true. Heather is a mentor and friend, as well as one of the most inspirational professors I had the pleasure of studying under when training as a writer myself at Kutztown University. It was my pleasure to bring Heather's beautiful spirit and abundant gifts to life on the web to promote the publication of her seventh poetry collection, her upcoming readings, and opportunities for writing students (young and old) to work with her through workshops and consultations. HF Planners designs beautiful, functional office spaces, and provides best-in-class facility planning and management services for clients like Verizon, Nestle, and AT&T. But their outdated site didn't represent HF Planners as a premier design firm. Founder and principal, Caroline Shelly, enlisted a team of experts to redefine HF Planners' brand, online presence, and marketing strategy. I led the team on the web design front, writing, designing, and building a custom Squarespace site that finally and fully expresses their brand, dedication to quality and service, and ability to create engaging, productive, and stunning office environments. As Nicole Thomson, owner of Map + Compass Photography, grew her business, she outgrew her old website. She wanted a new site that reflected her unique style and niche – photography of destination weddings and elopements, intimate weddings, and adventure couples sessions all over the world. Together, Nicole and I created the vision and strategic plan for a site that would resonate with her ideal clients. Thoughtful copywriting, extensive SEO, and a custom Squarespace design brought her style, brand, and vision alive. Nicole says, "My new site will grow with me as my business develops over the coming years!" 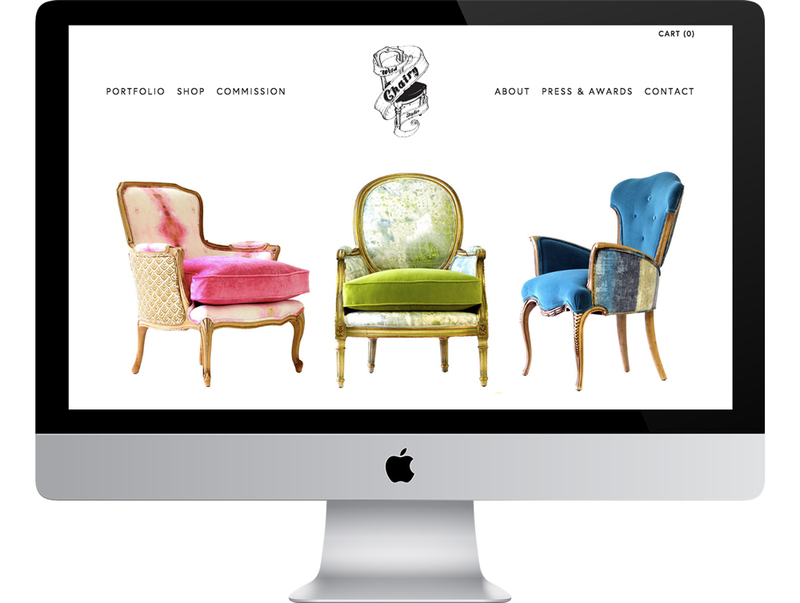 Andrea Mihalik, the award-winning artist and owner of Wild Chairy, had put off getting a new site for years. She didn't know what it should look like, or how to write about herself without it seeming like bragging. Andrea just wanted to make beautiful chairs and forget about the marketing stuff! After getting to know Andrea and her business, we defined her brand positioning, and I wrote each page of her new site to align with the strategy. Then, I custom-designed and built her Squarespace website to reflect the contemporary aesthetics and artisanal craftsmanship of her designs. New clients contacted her right away! Caly Doran knew she wanted website copy that connected with her ideal clients at first glance...conveyed her personality, expertise, and cinematic style as a photographer...and compelled her dream clients to connect with her. She just didn't know how to write website content that achieved all that by herself! To begin, I guided a conversation for Caly to consider her business, goals, style, personality, and her vision for the future. I developed those ideas into first, second, and third drafts – we collaborated closely to revise each. The result is compelling copy for her new website's Home, About, Services, and Contact pages! When artist and art educator Beth Krumholz was ready to launch her new business, she needed both strategic and aesthetic guidance for how to best represent her experience and services on the web. She was also fielding prospective client inquiries and needed a professional website yesterday. Through my 7 Days to Launch process, with an initial phase to determine Beth's business goals, focus, and strategy, I helped Beth shape the messaging for her site, as well as designed, built, and launched her new site in just 7 days. The Professional Development Group is a business consulting firm that develops inspiring leaders, high performing teams, great places to work, and meaningful growth for its clients. I'm proud to provide ongoing marketing, client communications, design, and web design and management services as part of this wonderful team, collaborating directly with its founder and CEO. DRAPER-DBS is an industry-leading, award-winning manufacturer of high end custom cabinetry. The busy president of the company wanted a new website but a painless, hands-off experience in getting one – so he trusted me to create the strategy, all copywriting, and page designs, and to hire and oversee the developer and process. I now handle site administration through a WordPress CMS. I created MenAskEm.com, a website that shares smart online dating advice for men. Now attracting 70,000+ visitors a month, I serve my audience through long-form articles optimized for SEO that provide actionable strategies to solve common online dating problems. With select clients, I work one-on-one to write engaging and effective online dating profiles to attract the right women and launch lasting relationships. From copy-editing the manuscript, to creating an original book layout designed to guide, inspire, and compel the reader on, to managing every aspect of self-publishing on Amazon using CreateSpace, it was a true honor to put this book into the world! Shawn Kent Hayashi's previous books were published through McGraw Hill. But when this executive coach, consultant, and founder and CEO of The Professional Development Group was ready to publish her next book, she wanted full ownership over the process in bringing her book to readers around the globe. To publish on Amazon in print and Kindle, I creating an original book design, copy-edited and laid-out the 200-page manuscript, and managed every aspect of self-publishing on Amazon through CreateSpace and Kindle Direct Publishing. As a credited contributor, I also participated in the overall editing of the book's content and flow as part of Shawn's team at The Professional Development Group. This important book reveals how to find happiness, conquer fear, build stronger relationships, and create a life filled with purpose and passion. I'm very proud to have been part of it. Kelly Stewart, founder of Attractivate, is an exceptional marketing strategist whose work is research-based, purpose-driven, and future-thinking. It was a delight to design Attractivate's ebook, The Marketing Road Less Traveled, sharing Kelly's thought leadership for the future of B2B marketing. I also created an ebook design template in Canva so that Kelly was empowered to create, update, and revise her collection of positive-business ebooks on her own.